Need light? The oil burning Dietz Jupiter Lantern is bright illumination! With an average of 12 candle power (and a maximum of 18 cp), it's perfect for inside cooking, chores and projects. Let there be light in the outside wind; The Dietz 2500 Jupiter Lantern is made for campsites and lighting up the darkness. 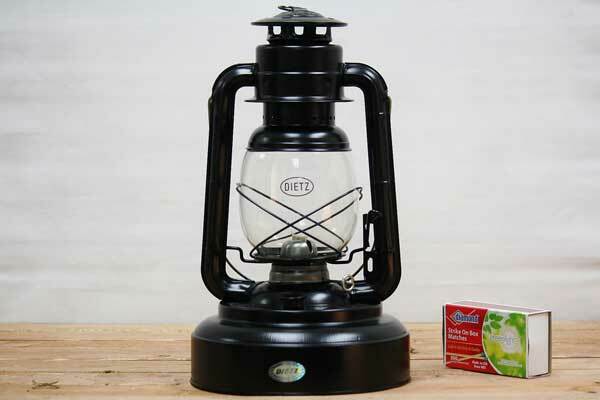 Practice good emergency planning and have this lantern on hand when the power goes out. The lantern was originally made to help keep greenhouses warm; an oil lantern this large will put off heat. The giant 84 oz tank can be used every evening for two weeks without refilling! Thumb lever for easy wick lighting and trimming. Made by Dietz Lantern Company. For a lantern just as large but with a different style check out the Dietz Blizzard Lanterns.